Isle of Wight day’s events are in full swing with the continuing aim to raise money for local causes, showcase local talent and fabulous places, and reunite family, friends and visitors alike to enjoy our beautiful island. One of the many planned projects this year is to celebrate and promote the fantastic local produce available on our doorstep through the many fabulous kitchens on our wonderful island. Isle of Wight Pubs, Restaurants, Cafes, and Hotels are creating a dish using locally sourced Isle of Wight ingredients to prepare a “Dish of the Isle of Wight Day”. Pan-fried bacon and onion, drizzled with homemade béchamel sauce and topped with mouth-watering IOW Gallybagger cheese. Served with chips & garnish. 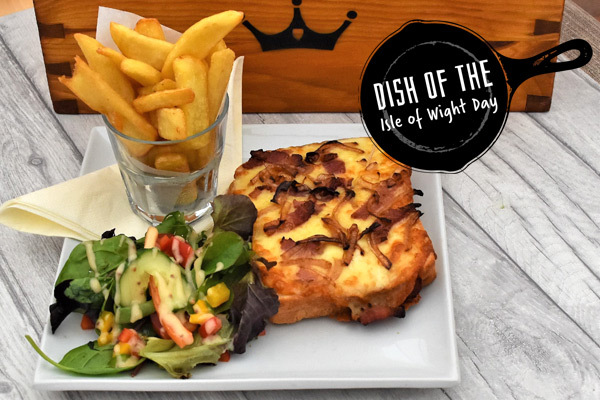 Join us in celebrating what our beautiful island has to offer by trying our ‘IOW Day Croque Monsieur’ and vote for our dish here.